Little girls are more attracted towards dancing, cooking and adorning themselves and so toy gifts related to these could be ideal for them. Here are some wonderful toys meant for little girls aged 3 years and above. These are also the best sellers on sites like Amazon. This is one toy that can really mesmerize the little girls. According to me this could be the best toy to gift someone at Christmas or any other occasion. Helen Beatrix Potter was a woman and she was an English author who used to publish children books. She was a very popular writer of children story books during her time. 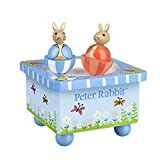 Peter Rabbit and Flopsy Bunny were the two prominent characters in her story books and these two characters are the dancing figures in this wonderful toy. Both these characters are fixed in their respective baskets (forming 2 figures of the toy) and both the baskets are free to rotate (dance) on the rounded central portion of a wooden music box. Both the characters and the music box are creatively designed and represents one of the best color combinations. Your little girl has to simply pick up the two figures in her hand and simply put them in the central rounded portion of the music box. The central rounded portion is actually the stage which is being moved and controlled through a key located underneath the music box. Just you need to roll the key several times and hold and than release the hold (wind up the key ) and it will make the central stage to start rotating and also some nice music will come out. Since the two figures are located on the central stage with magnetic forces, they start dancing (rotating) in a cute and funny way and that is the major fun part of this toy. When you watch the characters dancing it looks simply awesome. This is one of the best rated toys on Amazon and you can check out this youtube video to see the toy in action. This toy is best suited for little girls above 3 years. This is an awesome playset for little girls who want to dress up and adorn themselves. The main parts of this playset are a beautiful dressing table, three fold fabulous magic mirror seated on to the dressing table and a stool for the little girl to sit in front of the mirror. 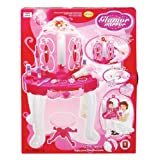 Best part of this playset is the battery operated magic infrared wand (acting as a remote control) which can be used to open the mirror and make it three fold from one fold. You can just watch this youtube video where the opening of mirror through the wand is in action. As the mirror opens it also produces flashing lights along with a lovely song. Other decorative accessories like a working hair drier, jewellery, cosmetic bottles, comb, lipistic, powder etc are also provided along with the playset. But all these accessories are meant only for pretend play. This is again one of the best selling playsets for little girls (3 years and above). The little girl will be on her way to serve others this time through pretend cooking and preparing breakfast. 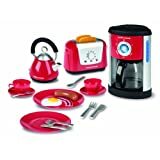 The playset simply looks gorgeous and various kitchen products involved in the playset are like coffee pot and coffee maker, cups and saucers, plates, kettle, toaster, slices of toast (for pretend eating) and sets of cutlery. All these products are basically meant to prepare tea and bread toast for the breakfast. The complete set is of good quality and made from plastic material of high quality. Lot of fun activities can be performed with toaster and coffee maker. For example, just push the lever of the toaster down and immediately it pops the toast up. Here is a nice video to watch the kids in action with this playset. This device will help you to run or play your battery operated toys for many extended days by recycling their battery life.